Comments:Live Concert footage, instrumental and vocal performances, hula and interviews. 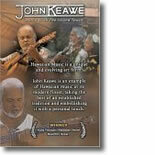 An insightful documentary that captures the eloquent artistry of one of Hawai`i's most gifted Slack Key Guitar players. Hawaiian music is a unique and evolving art form. John Keawe is an example of Hawaiian music at its finest, taking the best of an established tradition and embellishing it with a personal touch.